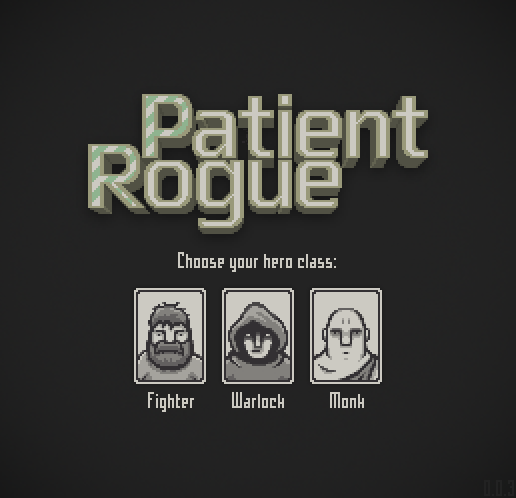 Version 0.0.3 of Patient Rogue is available at http://rogue.watabou.ru/. For the time being I'm going to upload updates there to preserve the original 7drl version here. Charm is reworked to make the spell more interesting. A charmed monster is no longer a single-use weapon, but a creature with its own health pool. Rest is reworked to make it more useful. Regardless the current level of health and hunger it now heals the hero completely and makes him starve. Fighter - the hero of the original version. Probably I should rename him, because he is not any better at melee than the other 2 classes. Warlock - he is good at charming monsters (at using charmed monsters to be exact). Has a smaller health pool, starts with an imp minion. Monk - master of unarmed combat. Has a larger health pool, but gets hungry faster.